It may seem like a daunting task: Riding 18, 38 or 62 miles on a bike after devouring Christmas cookie after Christmas cookie the month before. But, Brandon Snyder says anyone can do it. And he should know. His dad, Dean Snyder, rode in the first Dean’s Ride last year — a day after receiving chemotherapy treatments. Mr. Snyder died in August 2013, but the ride named after him is still in motion. 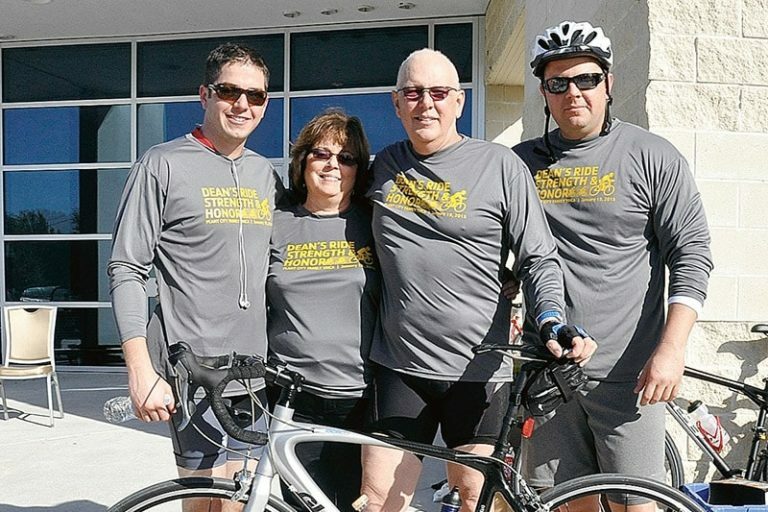 This year, his son is serving as the chairman of the second annual Dean’s Ride, which takes place Jan. 11, beginning and ending at HCC’s Plant City Campus. The ride benefits the Plant City Family YMCA’s LIVESTRONG program, which provides a wellness program for cancer survivors at not cost. The 12-week program is designed for adults who recently have become de-conditioned or chronically fatigued because of their treatment and disease. Snyder reintroduced his dad to riding. Mr. Snyder rode a lot with a neighbor when his son was young. Then, in 2009, Snyder picked up the bike to get back into shape. In Denver, he enjoyed mountain-biking on the rugged terrain. The daredevil even broke his collarbone at one point. Shortly after starting the hobby, he encouraged his dad to join the fitness craze. A member of the Plant City Family YMCA, Mr. Snyder already participated in cycling and spin classes. So, it wasn’t hard for him to develop a love for the sport. And although Florida is known for its flat topography and sandy beaches, the duo found their own places to ride. Mr. Snyder was hooked. When he was diagnosed with cancer, he used cycling as an outlet. That outlet turned into a way for him to help others. After his own father died of cancer, Dean Snyder began volunteering with the American Cancer Society. He thought of the idea of having a local charity ride in the past, but it never came to fruition. His diagnosis and rediscovered passion led him to found Dean’s Ride. Last year, there were two route options — 18- and 38-mile courses. This year, also will be a 62-mile course. It’s a ride, not a race, so the routes are fitted for anyone from novices to avid riders. Snyder, his brother, Adam, and Mr. Snyder all rode in last year’s event. Dean’s wife, Mikie, drove the repair truck. This year, Snyder wants to convince her to ride. Already, the committee has almost tripled sponsorships and is expecting about 150 riders. Organizers want the ride to be more like a festival, with beer and booths waiting at the end. DETAILS: Route support and rest stops provided; light breakfast and lunch included. REGISTRATION: tampaymca.org, active.com or mail your registration to the Plant City Family YMCA, 1507 YMCA Place, Plant City, FL. 33563.